COMMit strives to be the leading organization in the UAE for IT Consultancy, Integration and Support service. Providing QUALITY SERVICES is the shared responsibility of our Managers, Support Staff, Back Office Employees, Sub – Contractors and Suppliers. In our endeavour to always EXCEED OUR CUSTOMER’S EXPECTATIONS, we persistently improve the effectiveness of our Quality Management System. We commit our resources to keep all our Stakeholders, Customers, Promoters, Suppliers, Employees and applicable regulatory bodies satisfied. COMMit diligently works towards maintaining high quality standards and provide the best possible quality service to the customers. We are proud to have a team that works towards achieving higher standards day by day and constantly adapts to changes in order to perfect and improve our quality standards. 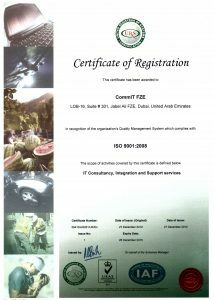 COMMit is proud to be an accomplished ISO 9001:2008 certified company and have been endorsed for having outstanding quality processes and management. 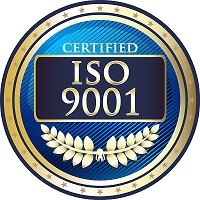 The ISO certification is an International standard put in place to ensure companies with the certification which confirms to provide the same high standards of quality to each and every customer. Choosing to buy products and services from only ISO certified companies’ means you are buying from companies that have their standards of quality checked and governed by professional and external international auditing firms. This endorses their credibility and rules out any chances of substandard services. COMMit values a high standard and quality of products and services. Our management team conducts quarterly internal audits to ensure that the same high standards are maintained in each department. Through high quality services COMMit has maintained legacy customers for more than 15 years. Our Quality Policy is very important to us as is exceeding our customers’ expectations. We strive to be the best IT services provider in the UAE.